TEDxUMKC takes place March 14 at the National World War I Museum. Two School of Medicine faculty members will speak at TEDxUMKC, an event organized primarily by medical students. Independently organized, TEDx events are modeled after and operate under a license from TED, the nonprofit known for its lecture series in which speakers have 18 minutes to present ideas about science, technology, creativity and other realms. 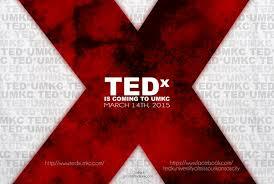 TEDxUMKC will take place March 14 from from 1–5 p.m. in the auditorium at the National World War I Museum. Speakers will include Nicholas Comninellis, M.D. ’82, M.P.H., clinical assistant professor of community and family medicine and founder of the Institute for International Medicine, and Stephen Kingsmore, M.B., Ch.B., D.Sc., professor of pediatrics and director of the Center for Pediatric Genome Medicine at Children’s Mercy. Tickets for seating in the auditorium are no longer available. Tickets remain for a livestream of the event in the museum’s reception area. Registration information, a full list of speakers and other details are available online. The March 14 event will be the third TEDxUMKC conference and the first to take place off-campus. Fifth-year medical student Harika Nalluri has served as the head curator of TEDxUMKC since the inaugural conference was held at the Volker campus in the fall of 2012. “It’s been a great way to make connections with people who have made huge impacts in Kansas City,” she said. Nalluri said she was inspired to put together an event at UMKC after attending the annual TEDxKC conference. She sought the advice of Mike Lundgren, the organizer of TEDxKC, which outgrew a 500-seat auditorium at the Nelson-Atkins Museum of Art and now takes place at the Kauffman Center for the Performing Arts. The most recent TEDxUMKC was held in the Student Union Theater. The event sold out, and one video presentation appeared on the TEDTalks YouTube channel. William Black, associate professor of economics and law at UMKC and an expert in the banking industry, gave the talk, which has been viewed more than 1 million times. Third-year medical student Rahul Maheshwari is the co-curator of this year’s TEDxUMKC. Medical students Max Holtmann, Divya Igwe, Brooks Kimmis, Jacob Lee, Shubhu Sekhon and Ryan Sieli also serve on the board. We are taught what processes worked for our ancestors and we observe those same processes being utilized by others around us. Accordingly, more often than not, we follow suit. Ditching Dogma is about creativity, innovation, and thinking differently: not accepting the notion that we should do things simply because “that’s how they’ve always been done,” rewarding those who take risks while casting away notions of traditionalism. Sieli said the ditching dogma theme was inspired by Gary Gaddis, M.D., Ph.D., Missouri Endowed Chair for Emergency Medicine, who uses the phrase when he talks about research projects that interest him. Dignitaries from UMKC as well as Kansas City and Missouri gathered to celebrate on Oct. 2 the grand openining of the new student apartments on Hospital Hill. As apartment buildings go, this one was always intended to be more than just a roof, a view and an in-unit washer and dryer. High expectations surrounded the construction of the first Hospital Hill Campus student housing project by the University of Missouri-Kansas City. The new structure is supposed to help draw the most talented future nurses, dentists, pharmacists and physicians to study and practice in Kansas City; stabilize an evolving neighborhood; stimulate spinoff development; promote increased student traffic between UMKC’s two campuses; and help break down a generations-old racial barrier. State and city dignitaries, neighborhood leaders, university officials, faculty, staff and students gathered at the Hospital Hill Apartments for a grand opening celebration and delivered their verdict: Mission accomplished. Developer Hugh Zimmer, one of the leaders of the Beacon Hill Development Corporation that built the project, summed up the group’s feelings about the realization of a long-held “dream” to restore a once-proud and stable middle-class neighborhood called Beacon Hill. “Since the groundbreaking for this project, 12 additional new homes have been completed and 10 additional lots have been sold, and 28 additional lots will be available for sale in the next few months,” Zimmer said. A healthy-food grocery sponsored by Truman Medical Centers and a boutique hotel are in the planning stages; and the apartments are filled with a diverse mix of bright, eager students – 60 percent of whom take all or most of their classes at the UMKC Volker Campus four miles away. Vaishnaui Vaidyanathan, MS 3, moved into the new apartment complex in August and now serves as a resident assistant. Vaidyanathan said she appreciated the convenience of living near the medical school and hospital and for her classes and clinical rotations. She said she also likes the diversity of the student body in the apartments. A procession of speakers representing a variety of stakeholders participated in a ribbon-tying ceremony, as opposed to a ribbon-cutting. UMKC Chancellor Leo E. Morton explained the symbolism. Missouri Secretary of State Jason Kander said the building is a key addition to a Hospital Hill district that is the epicenter of a growing industry vital to Kansas City’s future – health care. 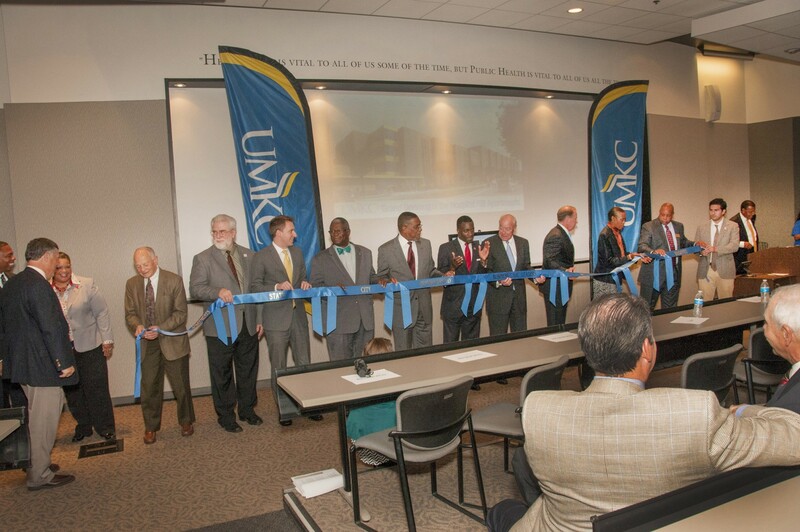 Mayor Sly James added that the building is both “an exciting milestone for UMKC and for this entire community,” as well as an amenity that will help to attract and keep highly talented young people from around the region and country to Kansas City. Juan Garcia, president of the UMKC Student Government Association, said completion of UMKC’s fourth student housing building represents an evolutionary change for the university’s student body. “We have more students living on-campus or within walking distance in community rental housing, than ever before,” Garcia said. Morton singled out Nikki Krawitz, the longtime vice president for finance and administration for the University of Missouri System. Steven L. Kanter, M.D., has been appointed dean of the School of Medicine at the University of Missouri-Kansas City. Kanter is a neurosurgeon, a career physician-educator, and brings to UMKC a strong foundation in the growing field of medical informatics: the science of using information most effectively to improve the quality and safety of patient care; to analyze data across large blocks of patient populations to identify patterns and best practices; and to collect, analyze, and integrate complex biologic data. UMKC and its local hospital partners are home to several leading researchers in the field, and created a new Center for Health Insights focused on informatics last year to support their work. 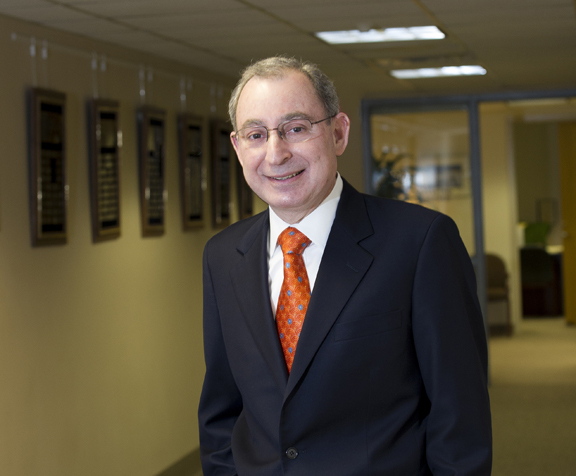 Kanter is a former Fellow in Medical Informatics for the National Library of Medicine. Kanter comes to UMKC from the University of Pittsburgh School of Medicine in Pennsylvania, where he has been on faculty since 1991 and Vice Dean since 2002. From 2008 to 2012, he also served as Editor-in-Chief of Academic Medicine, the Journal of the Association of American Medical Colleges. In 2013, he was awarded the Merrell Flair Award, the highest honor awarded by AAMC’s Group on Educational Affairs. 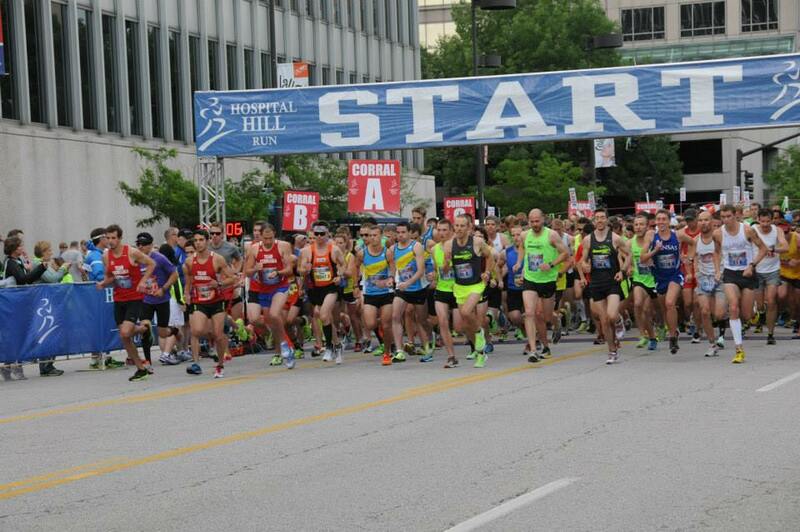 “I hope to focus the considerable talent and energy of the School of Medicine faculty, staff, and students on helping to make Kansas City the healthiest city in America,” Kanter said. “Of course, the best way – and the only way – to do this is to engage with business and community partners, clinical partners, alumni, and neighboring institutions. UMKC Chancellor Leo E. Morton said important considerations in his decision to choose Kanter were Kanter’s background and interest in both medical informatics and interprofessional education, which involves students from two or more disciplines learning together to cultivate collaborative practice to provide patient-centered care. UMKC’s Schools of Dentistry, Pharmacy, Medicine and Nursing and Health Studies, clustered together on the university’s Hospital Hill Campus, have made interprofessional education a priority. Lawrence Dreyfus, UMKC Vice Chancellor for Research & Economic Development, served as co-chair of the search committee that recommended Kanter. Kanter will begin his work at UMKC Oct. 1. 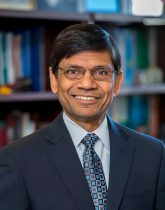 In addition to his position as dean, he is appointed as a full professor with tenure in the Department of Biomedical and Health Informatics and as Professor of Medicine in the Department of Internal Medicine. In addition, he will hold the Merl and Muriel Hicklin Foundation Endowed Chair at the School of Medicine. Kanter has an undergraduate degree from Texas A&I University and earned his M.D. at the University of Texas Medical School in San Antonio. He served his residency at the University of Florida. He was on faculty at Texas A&M University College of Medicine before moving to the University of Pittsburgh. He is a member of the American Medical Informatics Association, the World Association of Medical Editors and the Association for Medical Education in Europe, which presented him with the Patil Award for Best Medical Education Research Presentation in 2007. Kanter will replace Betty Drees, M.D., F.A.C.P., as dean. Drees spent 12 years leading the UMKC School of Medicine, during which she strengthened the financial position of the school, established important new partnerships with other academic units, and added new graduate and certificate programs. She will remain on faculty, and plans to work on patient safety and health policy programs as well as teaching and community service. In addition to applying advanced technology to the practice of medicine, Kanter is also interested in applying the latest technology to instructional practice. Kanter comes from a family immersed in medicine. His wife, Leslie M. Borsett-Kanter M.D., is a pediatrician with expertise in feeding disorders. His son, John H. Kanter, is a third-year medical student at Florida State University. His brother and sister, Roy A. Kanter M.D. and Merrill Kanter Carolin M.D., both are neurologists. Outside of work, Kanter and his wife enjoy jazz, reading and travel, and show Cardigan Welsh Corgis competitively. School of Medicine residents from the Emergency Medicine Residency program teammed up with emergency medical services personnel from the Grandview Fire Department on July 21 for EMS Field Day, a joint training session in out-of-hospital emergency and trauma services. 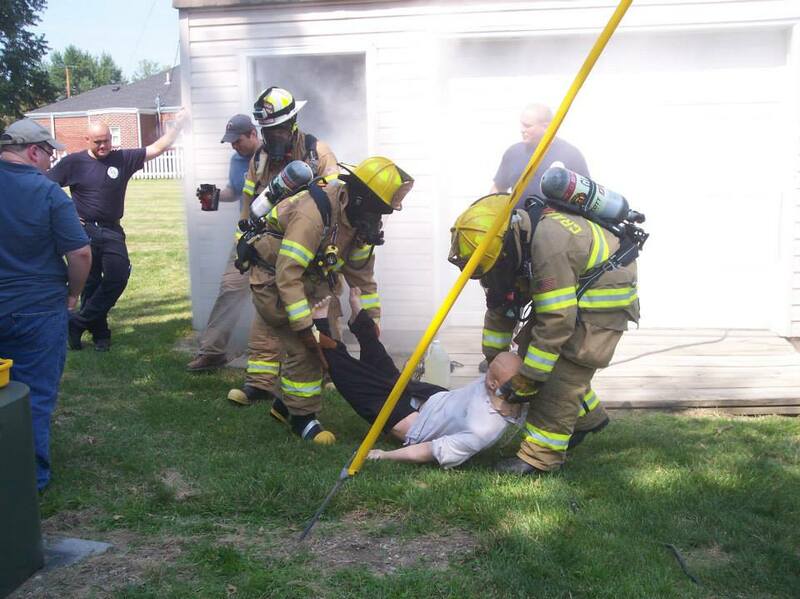 Smoke billowed from the door of a small Grandview, Mo., structure on July 21 as a group of UMKC School of Medicine Emergency Medicine Residents dressed in fire fighting gear ventured inside to rescue a victim. A short time later, they watched from nearby as an emergency medical crew from the Grandview Fire Department worked to extract an accident victim from a crushed vehicle. Fortunately, the victims were mannequins and the emergencies mere simulations. But for 11 members of the Emergency Medicine Residency program, the School’s first EMS Field Day provided a first-hand look at what takes place with trauma victims outside the hospital setting before they reach the emergency room. Before the day was over, residents had climbed to the top of the extension ladder on a Grandview fire truck and been introduced to Life Flight Eagle, an air-ambulance helicopter. The day-long program, including both classroom and hands-on simulations, was a joint training session bringing together Grandview EMS personnel and the resident emergency medicine physicians from UMKC coordinated by the School’s Department of Emergency Medicine, its Emergency Medical Services Program, the Grandview Fire Department and Life Flight Eagle. Ganss said the event provided residents with an eye-opening experience.